Ever heard that saying, “eat breakfast like a king, lunch like a prince and dinner like a pauper.” You have? Well, if our experience is anything to go by, every Hobart breakfast will be a right royal experience. That said, when booking accommodation in Hobart, room only/self catering is always a good idea. Because quite frankly, these breakfasts are too good to miss. 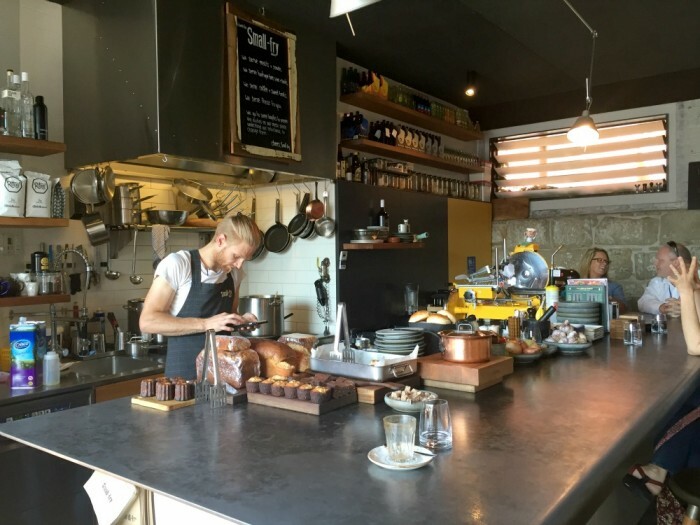 As for the caffeine, Hobart is a coffee lovers’ paradise. I’m beginning to think Hobart is the secret coffee capital of the world. If so, you heard it here first ‘kay?! Technically, you could rock up here for breakfast, brunch or lunch, and the food is as delicious as the choices are varied. It is definitely brunch o’clock by the time we arrive and we are well and truly spoilt for choice. In the end we settle on a bowl of the Tempura Mushrooms ($7.50), which come highly recommended and which we slather in honey soy sauce. You might have to wait for these to be cooked to order, but don’t worry the wait is totally worth it. 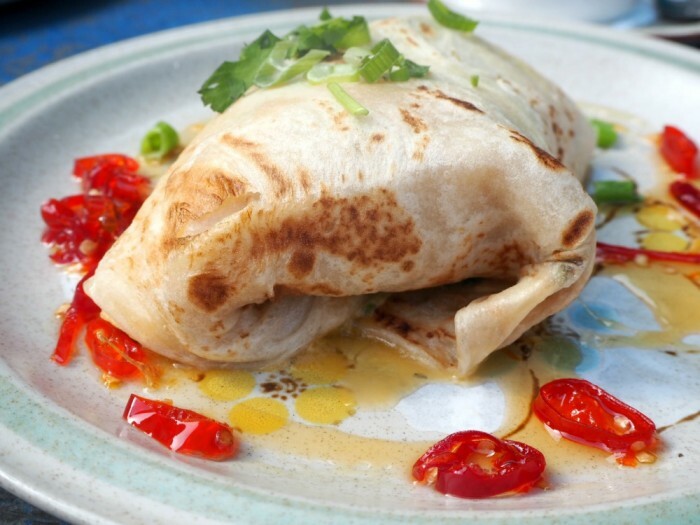 These are universally loved by meat eaters and vegetarians alike. 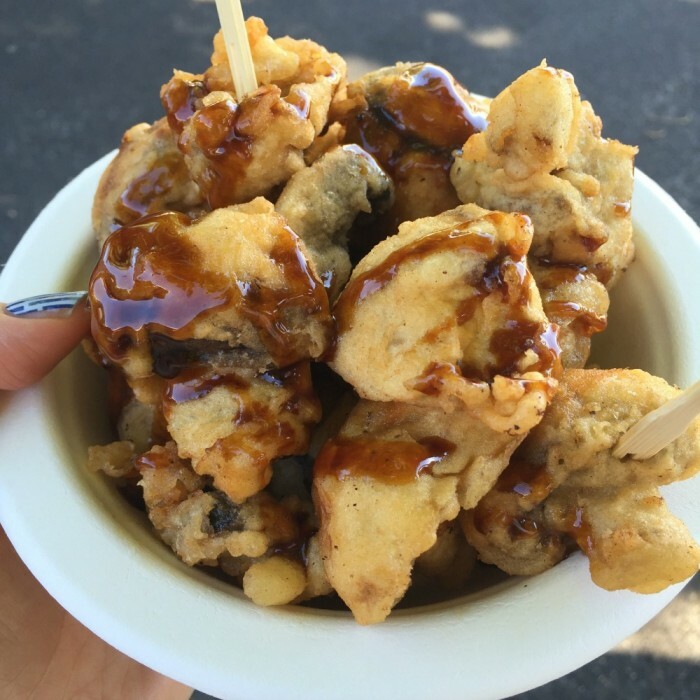 If you want to save stomach space, you can also buy Tempura Mushrooms on a stick($5). 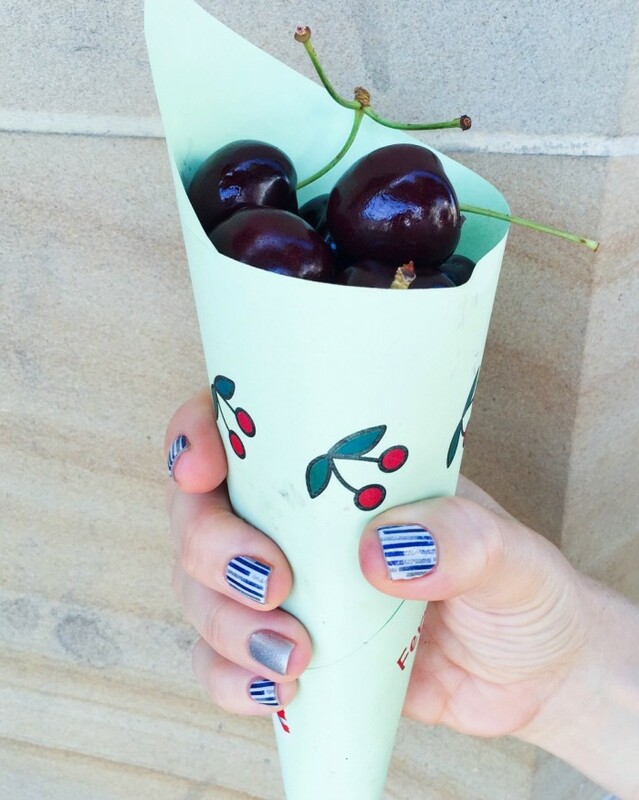 This market has more fresh produce than you can shake a stick at. The sushi and the Bruny Island Oysters here are meant to be amazing but I can’t stomach sushi for breakfast and I can’t stomach oysters for any meal. Ever. 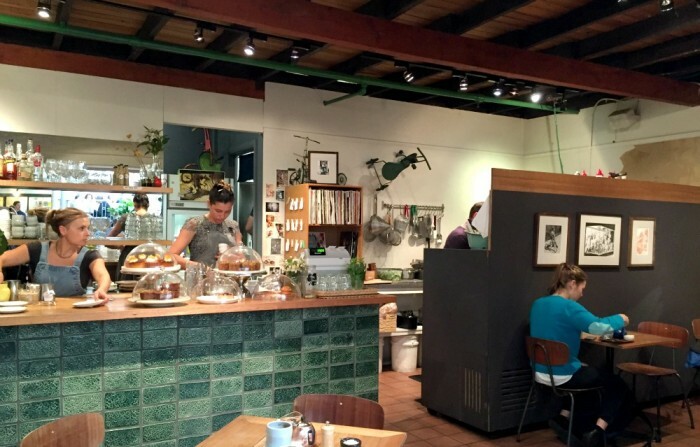 I recommend you pay a visit to The Flipped Egg and check out their breakfast menu – you won’t be disappointed. David says that the Bacon and Egg Roll with Tasmanian free-range bacon and egg, aioli, tomato relish and summer greens ($9) is the best he’d ever eaten and he should know. He’s eaten a lot of bacon and egg rolls. Look at this photo. 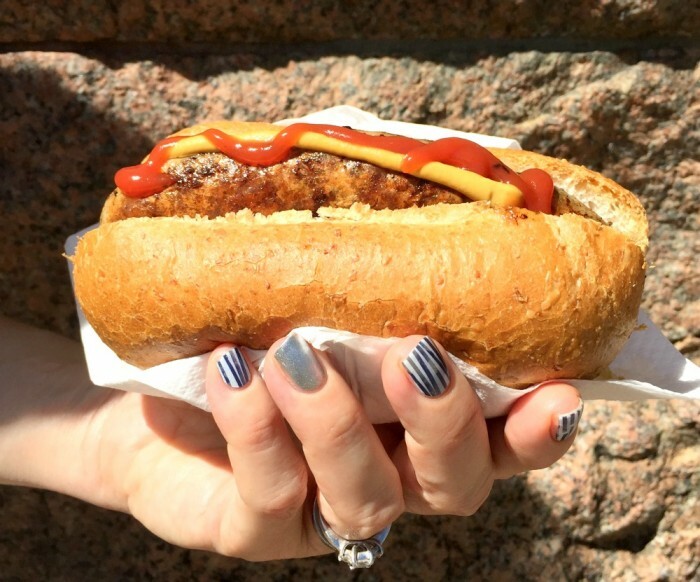 That’s Bacon and Egg Roll Love, that is! 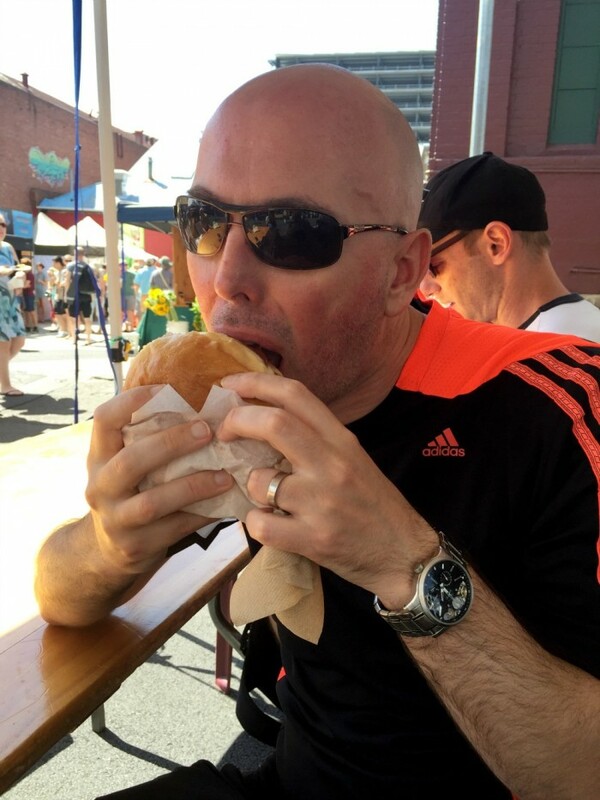 The Bacon and Egg Roll is good, but the Haloumi and Pumpkin Burger ($11) is amazing! Tasmanian fried haloumi cheese, roast pumpkin, balsamic onions, raw tabbouleh, tomato relish and summer greens – this is something you definitely want to try at home! 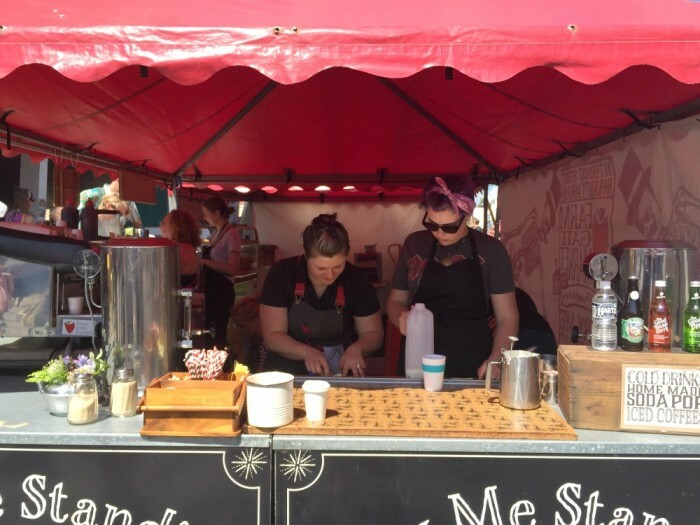 We grab some coffees at Bury Me Standing who sell home made bagels that look so good, I wish I had an expandable stomach. As it’s name suggests, this place is half cafe, half launderette; it’s bright, it’s retro and it’s very, very popular. The menu isn’t vast and has a number of variations on poached and scrambled eggs, but portions are generous, super delicious and served on seventies style plates that nana would be proud of. Oh, and the coffee is great too. 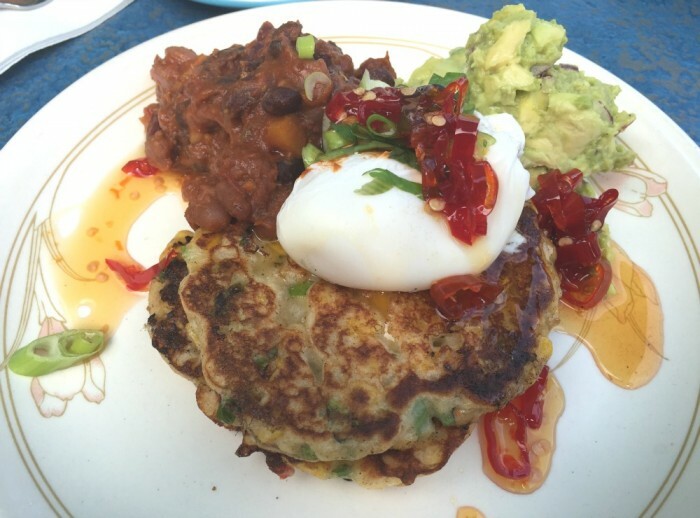 David enjoys his Corn and Ricotta Fritters with avocado salsa, baked beans, poached eggs and chilli jam($17). He has a thing about fritters and almost always orders them wherever he goes. He says they would go down in history as some of the finest fritters ever. I can’t go past the Machine Packed Roti Bread ($16) which is chock full of herbed scrambled egg and served with chilli jam. It is epic. The chilli jam is hands down the best chilli jam I have ever tasted – it starts off sweet but leaves your mouth feeling deliciously warm. It turns out the chilli jam is all made in house, no wonder it tastes so good. This place gets seriously busy, if there’s no space, put your name on the list, sit on one of the benches, play a game of giant chess or do a load of laundry. I promise you it will be worth the wait! You’ll find this gem tucked away in the Arts Centre in the Peacock Theatre Foyer (just look for the red tricycle). 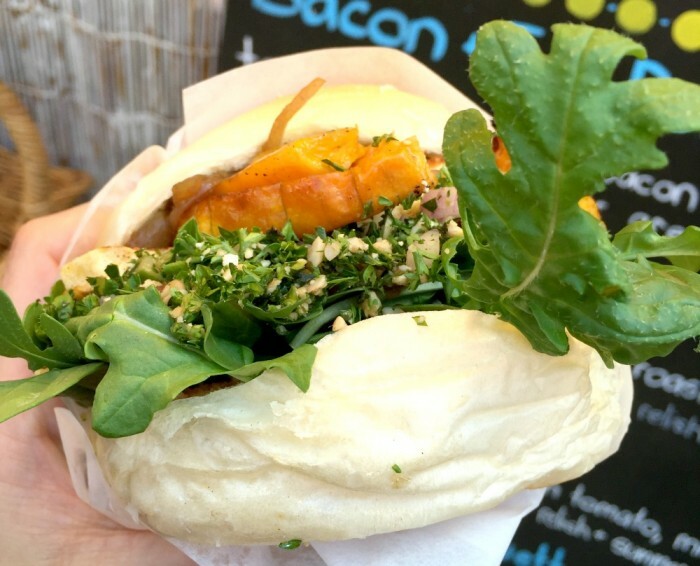 The menu is small but perfectly formed, there’s a really relaxed vibe and the staff are super helpful and friendly. Breakfast consists of a range of morning classics from free range scrambled eggs to toasties plus some daily specials. I notice that staff are happy to accommodate diners’ dietary requirements and a lot of the delicious looking baked goods are gluten free. 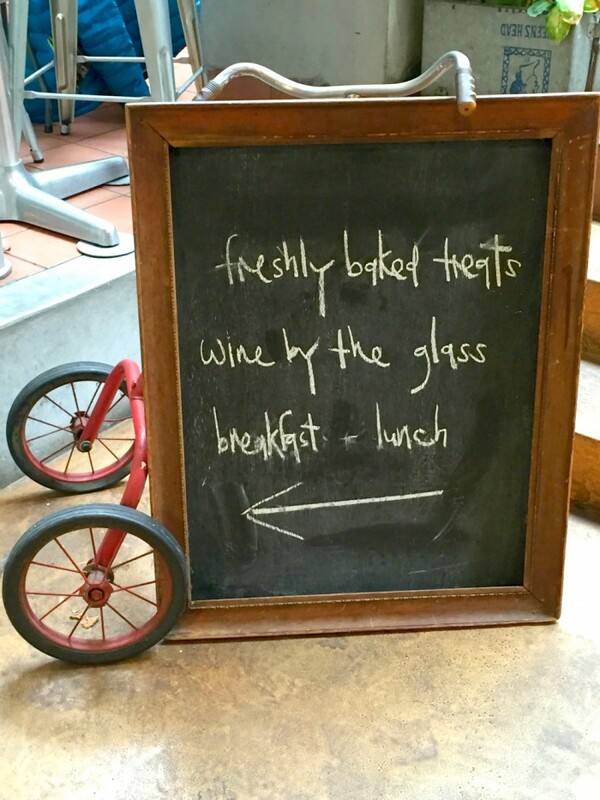 The coffee is mighty fine but if you fancy something stronger, pop by for a glass of wine at lunchtime. It should be noted that there’s no outside seating, although sitting outside in the theatre foyer has the look and feel of an indoor terrace. 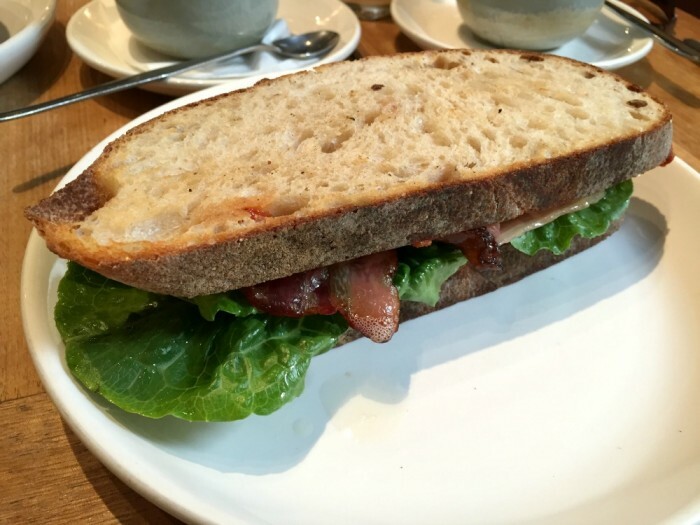 David is happy with his BLT ($13.5) – the cafe prides itself on sourcing it’s ingredients from local and organic suppliers and you can really taste the difference. 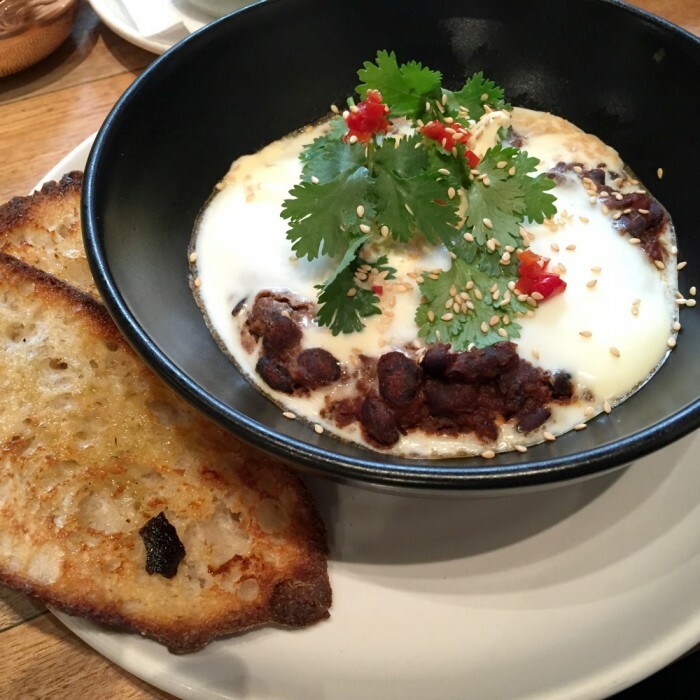 The Huevos El Horno, ($16.5) are calling my name; baked eggs, spicy black beans, sour cream, coriander, chilli and toast. It doesn’t disappoint, although I wouldn’t have minded less cream and more spice. 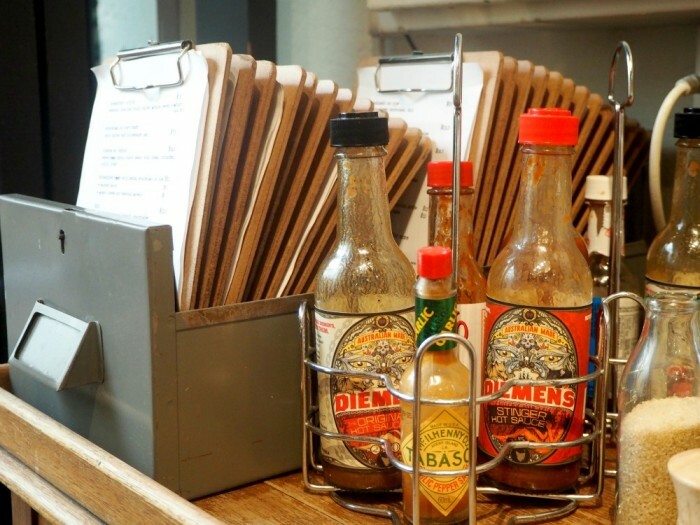 Talking of spice, you have to love a cafe that takes it’s spicy sauce so seriously. I’d go back just for the sauce! We don’t have time to stop for breakfast, but we always have time for coffee, especially when it tastes this good. This cafe bar is around the corner from our hotel and always seems to be busy. 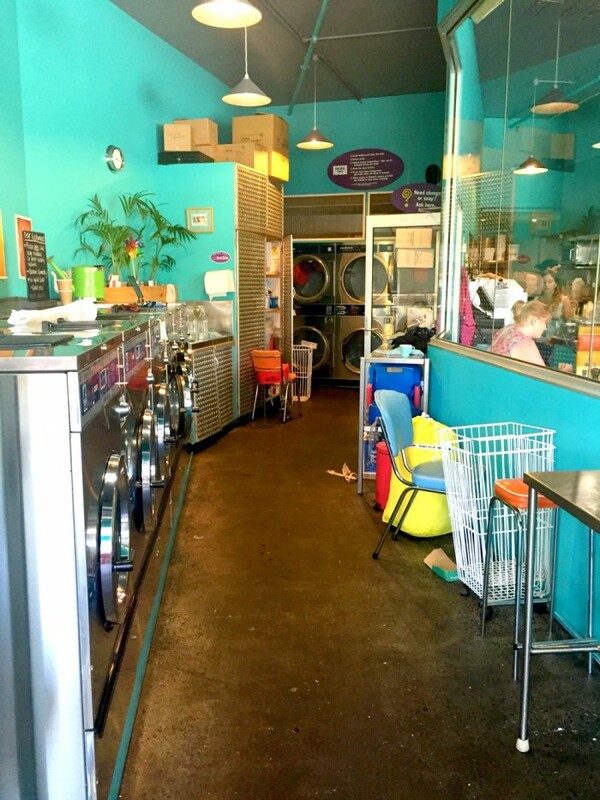 Inside there’s a cool, relaxed vibe and a big, shared counter. They do a roaring trade in take away and it’s easy to taste why. Be sure to check out the quirky menu cubes – they’re super cool! 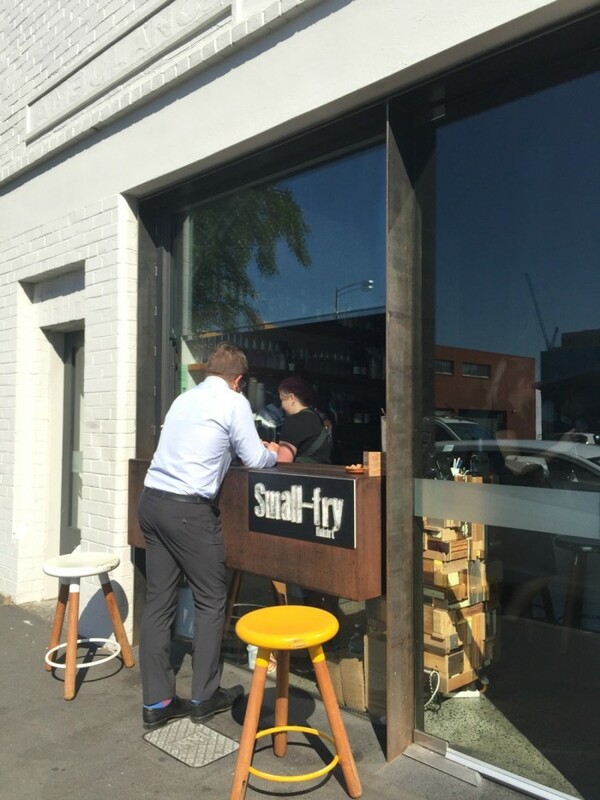 This cafe is cool and friendly and deadly serious about their coffee. They look deadly serious about their food too but we arrive way too late in the day for a feed. 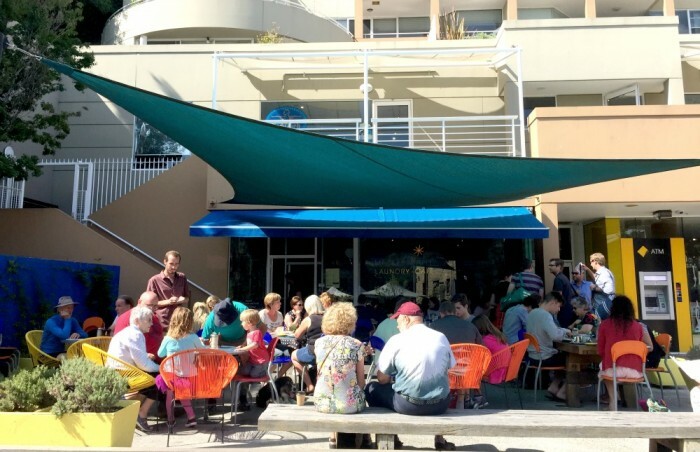 A must visit for foodies and caffiends alike. We don’t eat at this cool cafe in the heart of the CBD but the coffee is some of the best we tasted, and that’s saying something because all the coffee we tasted was caf-tastic! Do you eat a king’s breakfast? What’s your favourite cafe breakfast? Are you a caffiend too? 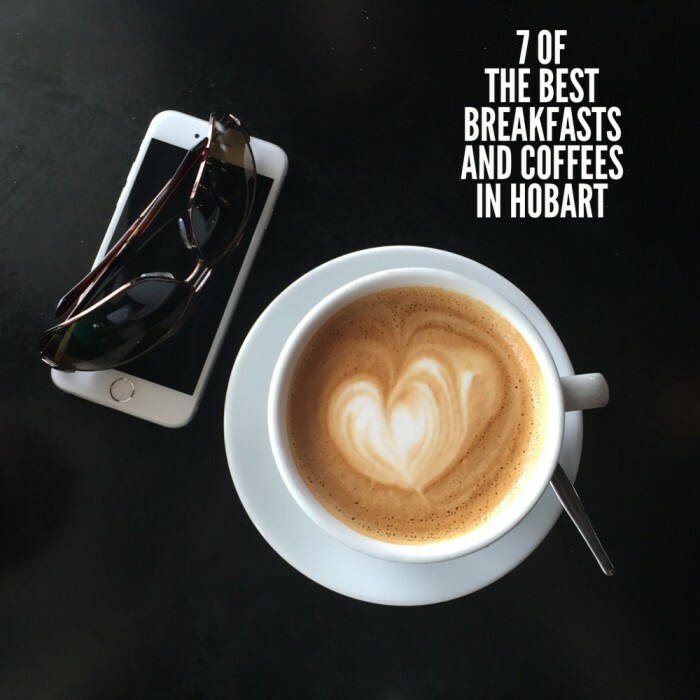 Have you got a Hobart haunt to add to the list? Do tell? This post is not sponsored in any way – we just had experiences that were too good not to share. All meals and coffees were independently paid for and all opinions are our own.